When Peter Ngimbwa, a Tanzanian student in The Ohio State University Department of Food, Agricultural, and Biological Engineering, defended his Master’s thesis and returned to Tanzania, it seemed possible that a drip irrigation planning tool he had developed along with faculty member Andy Ward might be destined for oblivion, as too often happens with student projects. But a team of undergraduates in the Department of Food, Agricultural and Biological Engineering at Ohio State took on the challenge of road-testing the digital tool and building a functioning drip irrigation system at Ohio State’s Waterman Agricultural and Natural Resources Laboratory. In developing countries such as Tanzania, being able to get crops through dry spells with irrigation can mean the difference between complete crop failure and having a harvest at all. Ward and Ngimbwa, who is now working at the National Carbon Monitoring Centre in Morogoro, Tanzania, developed the irrigation planning tool as a way to help people with different starting conditions easily determine the materials and setup they would need to implement drip irrigation. Working in consultation with Ward and Ngimbwa, a team of fourth-year engineering students used the tool to design and build a low-cost drip irrigation system for use in small farms. 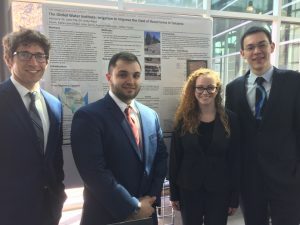 Katie-Lynn Dheel, John Sarris, Samuel Schroeder, and Stefan Tuefel collaborated with the Global Water Institute to develop the system tailored to the climate and agricultural needs of farms in the Singida region of Tanzania. In their system, the team chose to use a tank elevated on a cinderblock-and-dirt base. This allows the system to be pressurized by gravity, which reduces the cost and complexity of the system compared to irrigation systems that use pumps to generate flow. A series of flexible laterals from Jain Irrigation delivers water to the field. 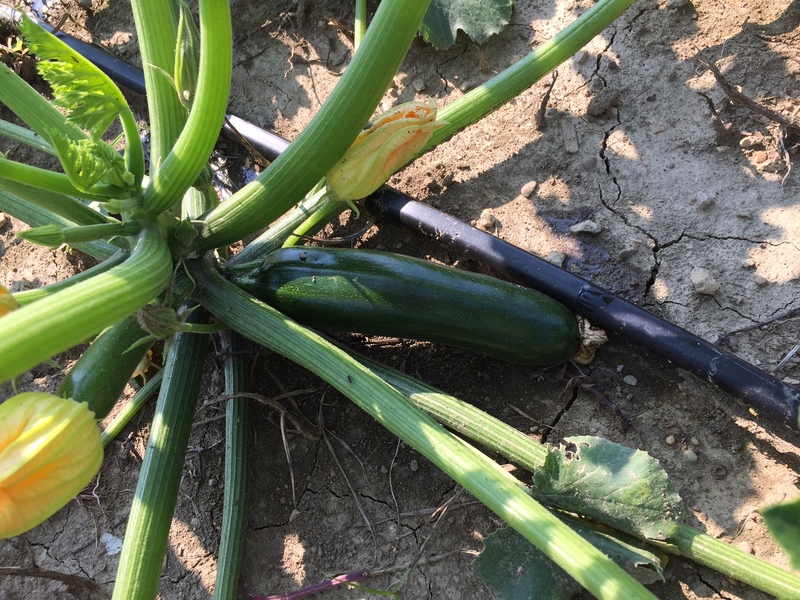 Fresh zucchini at the drip irrigation system. The prototype system on the Ohio State campus is being used to grow five crops—tomatoes, onions, peppers, cabbage, and zucchini—that would commonly be grown in Tanzania. Ohio’s summer climate is comparable to the Singida’s rainy season, so data on yields from the student farm plot in Ohio will be applicable to farms in that region. In the meantime, the students’ efforts are providing help closer to home, as they deliver hundreds of pounds of produce each week to a local food bank. 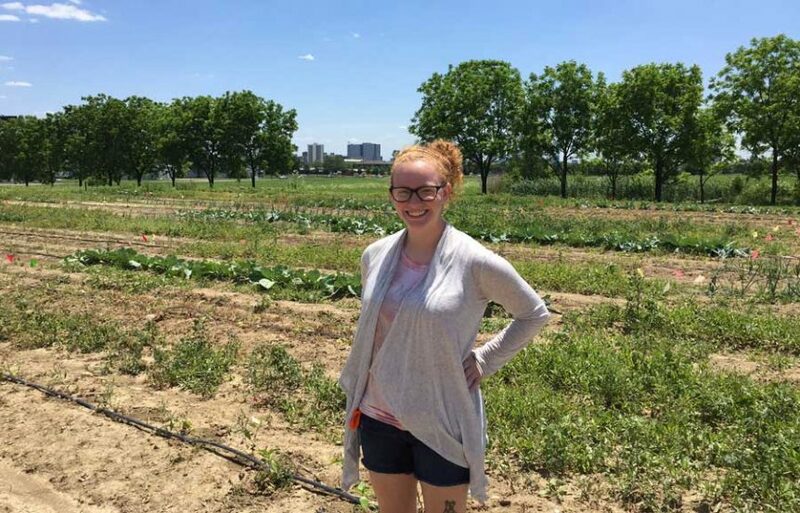 Photo above: Katie-Lynn Dheel takes a break from farming at the FABE test plot at the Waterman Agricultural and Natural Resources Laboratory on Ohio State’s Columbus campus. Photos courtesy of Jeff Melaragno.